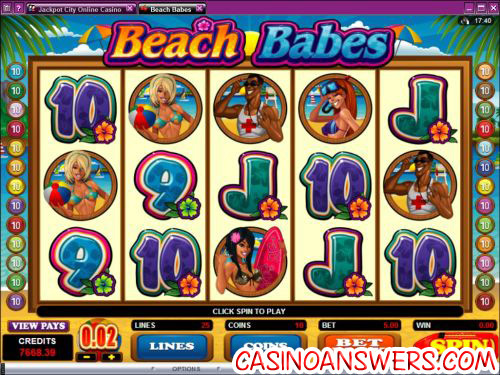 Beach Babes Video Slot Guide & Review - Casino Answers! Beach Babes is a 5-reel, 25-line video slot from the Microgaming casino software developer, featuring a wild symbol, scatter pays, free spins, multipliers and a gamble feature. You can play the Beach Babes video slot at King Neptunes Casino and Nostalgia Casino. With it being summer, there’s nothing better than sitting at home, making a deposit to your favourite online casino and playing some sweet video slots. While that might be up for debate, we can say that the Beach Babes video slot is a lot of fun and the risk of getting a burnt is a lot lower. Beach Babes features three different hot babes in bikinis as three of the symbols in the game. There’s a blonde, brunette and a redhead. There’s also a lifeguard for the ladies out there. All of these symbols pay out pretty well, too. Other symbols in the game are the Beach Babes logo (wild symbol), a cooler (scatter symbol) and a beach ball (another high paying symbol). To play the Beach Babes slot machine, set your coin value at one of the following sizes: $0.01, $0.02, $0.05, $0.10, $0.20 and $0.25. Now you can select the number of paylines (up to 25) and the number of coins (up to 10) you wish to play per spin on Beach Babes. The range of total bets you make on the Beach Babes video slot game starts at $0.01 all the way up to $62.50 per spin. To play the maximum bet of 25 paylines and 10 coins, use the “Bet Max” button or just hit “Spin” to play with whatever you have already set up. The top jackpot on the Beach Babes slot game is the Beach Babes logo. 5 of these Beach Babes symbols and you will win 10,000 coins. Not only that, but the Beach Babes symbol acts as a wild symbol that will substitute for other symbols in the game (except scatter symbols). Even better, it will double your win when substituting for another symbol! The Beach Babes logo symbol is easily the most desired symbol in the game (eye candy aside). The scatter symbol in Beach Babes is the Cooler symbol. If you hit three, four or five Cooler symbols in Beach Babes, you will trigger 20, 25 or 30 free spins respectively. That is a lot of free spins, especially considering your wins will all be multiplied by 6 during the free spins feature. Free spins can be re-triggered, so it is not unlikely that you can win 40, 50 or even 60 free spins. All bets and paylines played during the free spins feature are the same the bet that triggered the free spins feature. Scatter wins will be added to payline wins. All wins pay left to right only (scatters pay any). Only the highest win is paid per line. Payouts occur on enabled paylines only. Scatter wins are multiplied by the total bet. Hit the “Expert” button and you will now be able to access advanced features on the Beach Babes video slot, such as autoplay. Here you can set the number of autoplay spins from 5 to 500 and stop if a win exceeds or equals the amount you select. Autoplay will stop if you trigger the free spins feature. You can cancel autoplay at any time. Beach Babes is a lot of fun with some eye-pleasing art and atmospheric sound effects. We really liked the free spins feature, which may not necessarily be the easiest thing in the world to trigger, but when you do, it will pay off big time. To play the Beach Babes video slot and nearly 400 other games, sign up at King Neptunes Casino and get a 100% up to $100 signup bonus free! Are slots players from the USA able to play Beach Babes for real money? USA online casino players are not able to play at Microgaming-powered casinos. However, if they like the idea of a beach-themed casino, why not try Caribbean Gold Casino and take advantage of their 100% up to $1000 signup bonus? Are there any other Microgaming slots that feature hot chicks? If you like a little eye-candy in your video slot, we also have the Bomber Girls Video Slot Review for you to read.